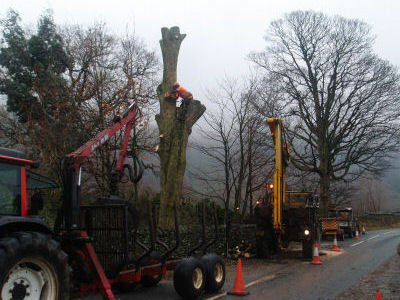 Professional tree management solutions - all our work is carried out in accordance with current legislation and arboricultural industry best practice. We offer a competent contract and risk management service to ensure you can concentrate on other commercial responsibilities with complete peace of mind. Comprehensive service - whether it’s supplying a new tree, regular hedge care, veteran tree management, dangerous tree removal or managing a whole woodland for commercial, recreational or environmental purposes, we’re qualified and equipped to advise and assist. Weed Control - we provide free, impartial advice and a comprehensive and cost-effective solution for the control of any unwanted infestations, including invasive species such as Giant Hogweed, Japanese Knotweed and Ragwort. Specialist equipment - we own a range of specialist and bespoke plant and equipment to ensure we can deliver on our promises. Specialist knowledge - we have a vast range of industry knowledge and experience ensuring that we always provide you with the most time and cost effective operational solution.